Because I know you all having love hearing me talk about MechWarrior every day, this week’s episode of Rambling Nerds is chock full MechWarrior goodness. Giant mechs, man. I just can’t get enough. When I was younger, before I wanted to be a cartoonist, I wanted to design video games, and before that I wanted to make giant robots. Then I took an electronics class and didn’t care for it at all. This entry was posted on Wednesday, November 7th, 2012 at 12:00 am and is filed under Comics. You can follow any responses to this entry through the RSS 2.0 feed. Both comments and pings are currently closed. I guess not many people who dream of being game designers actually become one. It’s difficult to break in the industry. Honestly, if the opportunity came along, I’d definitely give it a shot. At the time when we both could have tried to go to school for it, the industry was a shaky place, hell it still is. I weighed my two passions against each other, gaming and creative writing, and writing won. I do dream of writing a triple A game, but I’ll climb that mountain when I come to it. Yeah, i got my game design degree back in April, its hard to get a job as a game designer. Im now being groomed to take over the web development department at work and am working on a kick starter project with some friends. That sounds pretty good! Make sure you share that with us when it’s ready. Gross. 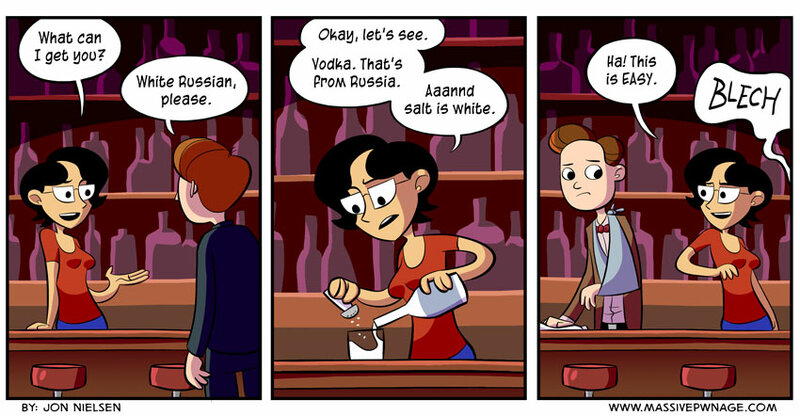 It’s been awhile since I’ve had a White Russian, but that’s not quite how I remember them. 🙂 Great strip.